Hi there! Welcome to Ashley's Belated Birthday Blog Hop!! Happy Birthday Ashley! If just you happened to hop on over and would like to start at the beginning click here! If you just came from Jamie you are in the right place! This adorable turtle is the Shell of a Good Time Cutting File by Kadoodle Bug Designs. Original Artwork is Kristi W. Designs. I added a Peachy Keen Face Everyday Characters! Your next stop is Jaymie! i love your card...thanks for sharing! Adorable...I love that Party Hat! Such a cute turtle with the party hat. Cute, cute,cute, love all those polka dots! 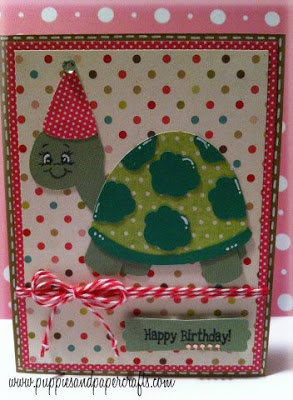 This turtle card is just tooo cute!!! aw, I just noticed I put the same as Candace. lol. I guess great minds! it is cute and the polka dot background is perfect!